A young boy sits in front of a destroyed building in Homs, Syria. 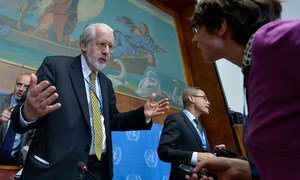 The majority of civilians in Syria continue to bear the brunt of the ongoing conflict, the head of a United Nations-appointed human rights panel said today, noting that violence has escalated to an unprecedented level, humanitarian aid is arbitrarily denied and perpetrators of crimes have no fear of consequence. “Impunity has made its home inside the Syrian Arab Republic,” Paulo Sérgio Pinheiro, Chair of the Independent International Commission of Inquiry on Syria, said during his presentation to the UN Human Rights Council in Geneva. The Commission, which also comprises Karen Koning AbuZayd, Carla del Ponte and Vitit Muntarbhorn, was established by the Council in August 2011 to investigate and record all violations of international human rights law during the Syria conflict. Presenting the Commission’s latest findings, Mr. Pinheiro said that the conflict in Syria – now in its fourth year – has reached a “tipping point,” threatening the entire region. “With warring parties in unrelenting pursuit of the illusion of military victory, violence has escalated to an unprecedented level. Perpetrators of crimes have no fear or thought of consequence,” he stated. It has done so, Mr. Pinheiro continued. “People are tortured to death inside detention centres in Damascus, men are beheaded in public squares in Al Raqqah, women live with the scars of sexual abuse, and children are recruited and used as members of fighting forces. He noted that the Government’s aerial bombardment, including its continued use of barrel bombs, across Syria results in significant civilian casualties and severe injuries, and people continue to be killed while held in Government detention centres, where torture remains in “widespread and systematic” use. The Commission recently received and has begun to investigate thousands of photographs of bodies, many of them emaciated, he said. Almost all bear marks of horrific abuse – including strangulation, mutilation, open wounds, burns and bruising. Such injuries are consistent with torture methods previously documented by the Commission. In addition, the Syrian Government and non-State armed groups continue to restrict the flow of food, water and medicines, ignoring the call made in Security Council resolution 2139 (2013). They have also deliberately disabled and destroyed essential civilian infrastructure, such as water distribution networks and electricity grids. Violence targeting humanitarian workers continues to obstruct the efforts of aid agencies to deliver assistance to those Syrians most in need. “Attempts to reach a negotiated political settlement appear to have been abandoned,” noted Mr. Pinheiro. “In response, the warring parties have recommitted themselves to the dangerous illusion that military victory is within reach. This illusion has led Syria down the path of more bloodshed, shattering a nation and leaving a legacy of violence that will scar generations to come. He went on to say that “influential States have turned away from the hard work that is required for a political solution,” adding that some States and individuals continue to deliver mass shipments of arms, artillery and aircraft to the Syrian Government, or contribute with logistical and strategic assistance. Other states support armed groups with weapons and financial support. “In so doing, they are fuelling a proxy war inside Syria,” said the Chairperson. “None of these States can claim ignorance of how their support will be used. Mr. Pinheiro stressed that accountability must be part of any future settlement, if it is to result in an enduring peace. “We have travelled historic distances in pursuit of justice in the former Yugoslavia, in Sierra Leone and in Rwanda, to name a few. But the international community has stumbled and fallen when it has come to seeking justice for, and in our protection of the Syrian people,” he noted. As the Syrian war enters a fourth year, the harrowing violence shows no signs of subsiding – the fighting has driven some nine million civilians from their homes and has reduced many of those who remain to scavenging – said the head of a United Nations-appointed human rights panel, denouncing the international community’s inaction in the pursuit of peace and accountability.